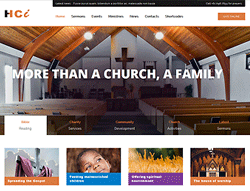 Holy Church is a fully responsive Joomla template tailored for religious and charity websites. The responsive design makes it suitable for all screen resolutions. This template requires no framework plugin to be installed in order for it to work. It features Sermon speaker for uploading and presenting daily, weekly and/or monthly sermons. Other than that, iCagenda ensures that your upcoming events are presented in an intuitive and stylish way. The template focuses on religious and society niche thus avoiding bloated code and pages allowing you to focus on the exact intended use.